Thanks for your interest in our Cornell Partnership! We’ll be in touch soon. For over a decade, through the combined support of the Edward L. Rose Conservancy, ACTUS Foundation, and Cornell University, the Conservancy has partnered with Cornell Department of Natural Resources to understand and conserve the natural resources of the region. Together, we have conducted cutting-edge research, established long-term biological inventories, monitored for environmental threats, developed demonstration sites, and conducted education programs for Conservancy and community members. Involving researchers and students, our joint efforts have yielded solid baseline data for wildlife populations, forests, and aquatic resources in the area. 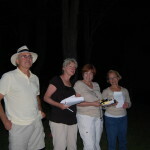 In addition, we have involved citizens in monitoring for wildlife such as bats, frogs, salamanders, snakes and turtles. Having researchers and students on-the-ground regularly has resulted in early detection of environmental threats. For example, alewife is an invasive fish species that inhabits Silver Lake, where efforts are ongoing to monitor for effects in the lake and reduce their numbers. Hemlock woolly adelgid also was detected at each of the Conservancy’s fee-owned properties and state-of-the-art monitoring and treatment techniques are being tested at these sites. To benefit the greater community, information derived from these studies is being shared with local landowners and neighboring lake associations. 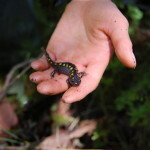 North American Amphibian Monitoring Program - https://www.pwrc.usgs.gov/naamp/ A national monitoring program run by the United States Geological Survey. 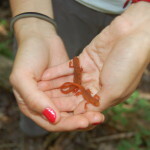 There are two routes in Susquehanna County, PA.
Pennsylvania Amphibian and Reptile Survey – http://paherpsurvey.org/ The Pennsylvania Fish and Boat Commission would like citizens to help document the presence of amphibians and reptiles throughout the state. Join the team (we will train anyone who is interested in participating) – learn to identify local amphibians and reptiles and venture outdoors to find them! We added over 60 records to the database for Susquehanna County in 2013 – that’s 70% of all records submitted! Bat Monitoring – A disease called white nose syndrome has resulted in the loss of millions of bats nationwide. Know of an existing bat colony? Help document remaining colonies by participating in the Pennsylvania Game Commissions monitoring efforts. Contact us for training and more information. Hemlock Woolly Adelgid and Emerald Ash Borer Monitoring – These two pests have the potential to change the composition of our forests in the upcoming decade. 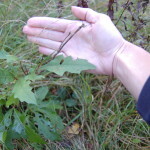 Learn to recognize these pests and monitor for their presence in the area.